Google loves its artwork, both literally in the form of its doodles and figuratively in the form of its Google Doodle salutes to various artist. The latest artist to be honored by a Google Doodle is Paul Cezanne, the famous French still life painter who was born on January 19, 1839. 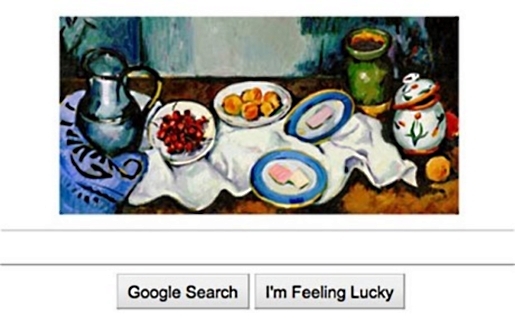 The Google Doodle is designed to honor Cezanne’s 172nd birthday. The thing that separated Cezanne from other artists was his prolific nature. He was a painter, and that’s all he had to do; his father was the founder of a bank and that lead to Cezanne finding financial support throughout his life, making him independently wealthy and needing no day job to support his art habit, though he did disappoint his father by not finishing law school at the University of Aix and dropping out to head to Paris to paint. However, like a lot of great artists, Cezanne was not accepted widely until well after his death. It wasn’t until September 1907 that Cezanne’s work became famous thanks to an exposition at the Salon d’Automne. Cezanne died on October 22, 2006. During Cezanne’s life, only one of his works, a portrait of his father Louis-Auguste Cezanne, found a home in the official Paris Salon. That didn’t stop Cezanne from inspiring 20th Century’s Cubism movement, including Picasso, Braque, Gris, and others.